'WWE NXT Takeover #1: Into the Fire' review: Stoking the flames of the Women's Evolution – AiPT! NXT’s Women’s Division is in the spotlight, giving the second generation a chance to shine. Just as NXT has taken the world by storm on the WWE Network, WWE NXT from BOOM! Studios has launched itself into the comics battle royale, vying for the spot as the best semi-fictional comic on the shelves today. The kayfabe storylines mixed with real-life events paint a picture of the WWE Superstars of the future, giving them, at times, more personality than they show on television. Mamma Mia! While most of the WWE comics from BOOM! have rotated between several short stories with varying degrees of truthiness, WWE NXT has stayed fairly close to actual events in the brand and beyond. The hows and whys are kayfabed, but the happenings are all on demand. This issue, Takeover: Into the Fire revolves around main roster Superstar Paige, scouting talent as she prepares to return from injury. Ignoring the actual events surrounding Paige’s missing year, we are told that she is coming back from injury, scouting up-and-comers so that she is not blindsided as she was with the Four Horsewomen: Charlotte, Bayley, Becky, and Sasha. With this as our frame story, writer Dennis Hopeless collects mini-bios on several women now on either Raw or SmackDown Live, including Ember Moon, Asuka, The IIconics, and others. While taking notes, she gets the idea to form a real stable, a throwback to her short-lived “Women’s Evolution” group PCB. Everyone gets a moment to shine in the comic, showcasing a bit of their personality pretty well. Hopeless gets each character and portrays them pretty much as we’ve seen them on screen. Artist Hyeonjin Kim, however, has a mixed bag of an outing in this one. Some of the women’s faces are spot on, other times they look like generic create-a-wrestlers from the mid-2000s. Paige just doesn’t look like Paige throughout most of the book. She has a very specific look, and it is not captured here. If they hadn’t called attention to her, I wouldn’t have even realized it was her. Not a good thing if you’re drawing one of the more iconic superstars of the late Divas era and current SmackDown Live General Manager. Between this issue and last issue’s portrayal of the late, great Dusty Rhodes, I feel like WWE NXT has hit its stride pretty well, telling a story that Dusty, and current COO and NXT Papa, Triple H, would love. 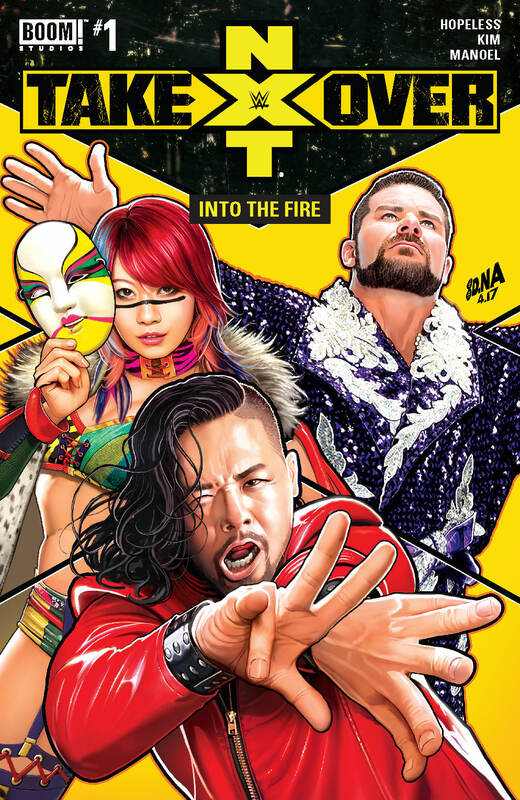 Between this issue and last issue's portrayal of the late, great Dusty Rhodes, I feel like WWE NXT has hit its stride pretty well, telling a story that Dusty, and current COO and NXT Papa, Triple H, would love.